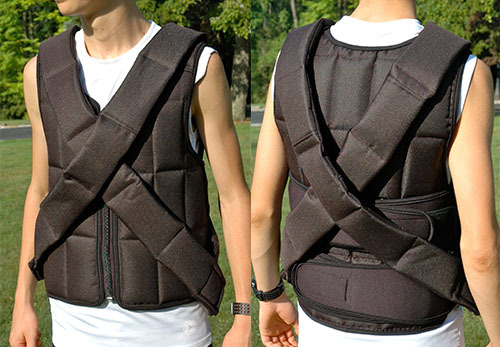 The Bandolier Irons™ are IRONWEAR®'s newest invention for increasing the intensity of your workout. The Bandolier Irons™ are shoulder bands that are designed to be slung over your shoulder for added resistance for all types of training. Designed especially for fire fighter, police, and military drills and tests. 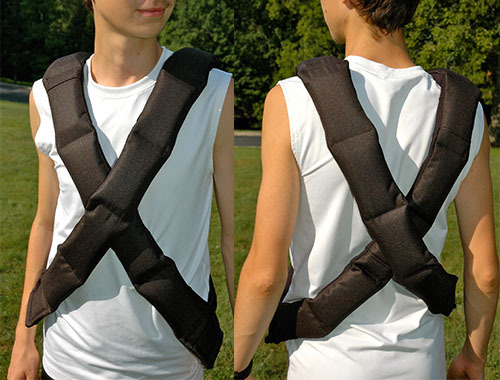 Each Bandolier Iron™ is adjustable from 1 to 16 pounds and comes with 10 stretch weight pockets into which one, two, or three standard IRONWEAR® 1/2 pound Flex-metal® weights can be inserted. Each heavy duty Bandolier Iron™ shell weighs about one pound by itself. 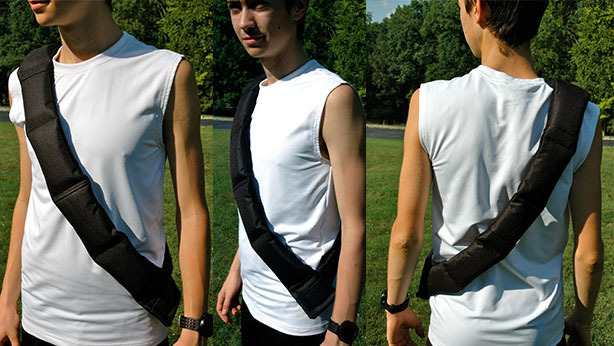 Bandolier Irons™ can be used alone, in a pair, or overlapped to carry more to get the desired weight for an exercise. The shell's outer surface is constructed of padded ballistic nylon and the inner surface is a stretch knitted nylon neoprene to hold the weights from all sides. 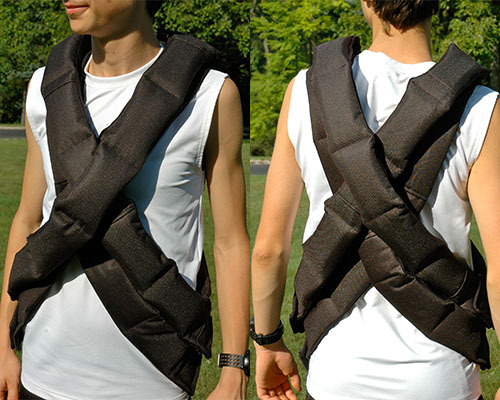 The Bandolier Irons™ let you add and take off weight faster than a weight vest or other weight system. Bandolier Irons are great for truing to carry hoses or gear up stairs, ladders, or hills. The Bandolier Irons™ are safer for the trainee and everyone around them. The Bandolier Irons™ are soft and padded, even the weights themselves are soft and they are much less likely to do damage if dropped or bumped against something or someone. Also, training with Bandolier Irons™ saves your equipment from possible damage during training exercises. One or more Bandolier Irons™ are great fro temporary added resistance. 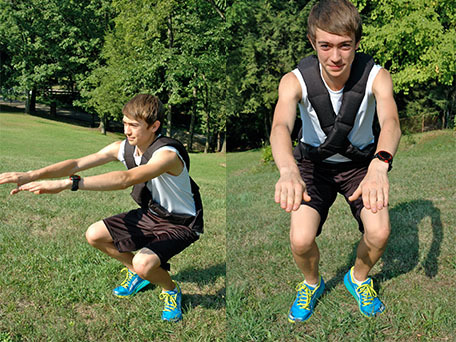 They can be worn over a weighted vest for maximizing resistance for an exercise. Use your creativity. Bandolier Irons™ can be used for all types of arm, leg, and neck exercises as well and can easily be used as a whole body exercise system you can carry anywhere on your shoulders, and can be used like kettle bells but are much safer and more versatile. The Bandolier Irons™ are a great weight storage system. If you already have IRONWEAR® products then Bandolier Irons™ are a great addition as a way to store and use extra Flex-metal® weights you may have or may want. The same 1/2 pound Flex-metal® weights fit into all IRONWEAR® adjustable weight products including- vests, pants, shoes, belts, head gear, blankets, hand, ankle, and more. Bandolier Irons™ are available as shells or with different amounts of weight. Bandolier Irons™ can be used alone or in pairs, or even multiple pairs.